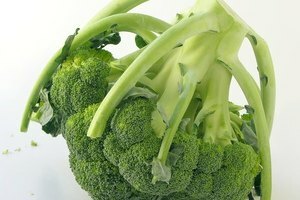 Steaming vegetables and other foods is a very healthy way to cook, and the easiest way to steam foods is in the microwave. With a micro cooker, you can steam, boil, and even melt butter with ease, and the cooker's lid is vented, so it serves as a strainer when you're done cooking. 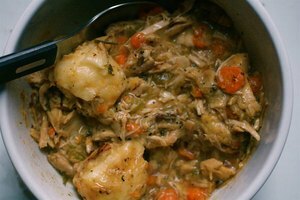 This article will give some simple instructions on how to use a micro cooker with a variety of foods. Notice the measuring marks on the inside of the micro cooker. Measuring isn't necessary, because your micro cooker is marked on the inside with 1, 2, 3, and 4 cup measurements. 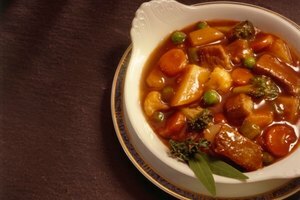 The basic instructions are to add water to the cooker, add the vegetables or food you want to cook, and then cook on high until the vegetables are done to your liking. 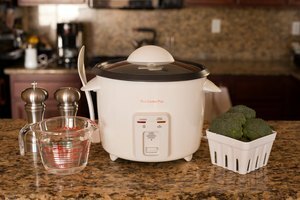 However, there are a lot more things you can do with the micro cooker, and you can cook entire dishes in the cooker, like beef stroganoff or soups and stews. Make rice in the micro cooker by adding about 1 3/4 cups of low-fat chicken or vegetable broth to your micro cooker. (You can use water, too, but the broth gives the rice a much richer flavor.) Add a cup of white or brown rice, a teaspoon or two of butter, margarine, or olive oil, and cook on high power for 5 minutes. Check to see if you need to add any more liquid at this point. Then, cook on 50 percent power for 15 minutes, or until the rice is done and the liquid is adsorbed. Cook fresh or frozen vegetables in the micro cooker by adding about 1/2 cup water or broth to the micro cooker, and then place the vegetables inside. Make sure the lid is securely fastened to the pot. Cook on high for about 5 minutes, and your vegetables are ready! Drain any remaining liquid by turning the pot upside down over the sink. Cook meats in the micro cooker. You don't need to add liquid, just put the meat inside the pot, and season it the way you like it. Cook for about 5 minutes on high, and test to see if the meat is done. Chicken breasts, hamburger, hot dogs, and just about anything you can think of can go into the micro cooker for fast cooking. Baking in your micro cooker is yet another way to use this versatile device. You can mix up a box of brownie mix and cook it in the microwave, and you can even make a kind of fruity cobbler dessert. To make the cobbler, you'll need a dozen oatmeal cookies, two cans of pie filling, and of course, a large micro cooker. Just crumble up 8 of the cookies in the bottom of the cooker, spread the pie filling evenly over the cookies, and top with the remaining 4 cookies, also crumbled. Bake in the microwave on high for about 9 minutes, and you'll have a hot, fruit cobbler that's incredibly easy to make. It's so easy to use the micro cooker, even kids can use it, and it's much safer than using the stove, especially for young children.